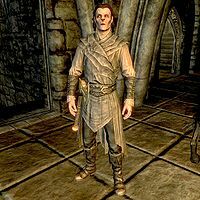 Rargal Thrallmaster is a Nord vampire in Volkihar Keep. As his name suggests, he oversees the vampire thralls and cattle. Rargal wears a set of light gray colored vampire armor with a matching pair of boots. He is equipped with a leveled one-handed weapon which can be up to Elven quality. He carries random leveled bandit loot, as well as a 25% chance of carrying 1-9 gold. When approached, he will warn, "You're new here, so I'll explain this once. You feed from the thralls as much as you like. You kill them, and I'll split you in half." Despite this threat, he will not acknowledge you killing any of the cattle. If questioned on the source of the thralls, he will elaborate, "All over Skyrim. It's my job to collect them. I try and keep something for everyone. For every taste, I mean. Sometimes you get one who comes willingly, but most have to be convinced to join us here." Rargal's body may never disappear from the walkway in front of Volkihar Keep after he dies during the events of Kindred Judgment. Open the console, click on his body, and use the command disable to remove his body from the game. This page was last modified on 6 February 2019, at 21:04.